RePub, Erasmus University Repository: Hospital Palliative Care Team Consultations For Patients With Advanced Cancer: Too few, too late? 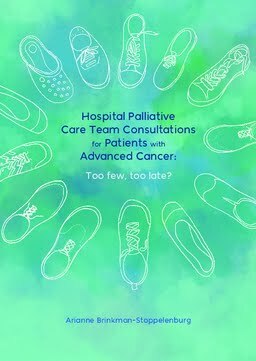 Hospital Palliative Care Team Consultations For Patients With Advanced Cancer: Too few, too late? Consultatie van palliatieve teams in het ziekenhuis voor patiënten met gevorderde kanker: te weinig, te laat? Palliative care is an approach that improves quality of life of patients and families facing a life-threatening illness. In hospitals, specialist palliative care is often provided by palliative care teams (PCTs). In the Netherlands, the number of PCTs has increased rapidly over the past years. The aim of this thesis was to investigate characteristics of palliative care team consultations for hospitalized patients with incurable cancer and their effect on quality of life, quality of dying and (costs of) care. Furthermore, additional research studies on consultation in palliative and end-of-life-care are described including a study on the developments in end-of-life decision making practices, a study on a specific type consultation, namely consultation of SCEN physicians in case of euthanasia requests and a systematic review on the effects of advance care planning. The thesis concludes with recommendations for clinical practice, policy and future research.